An Epson Stylus SX400 is a compact all-in-one printer that offers high-quality printing amongst the stylus range of inkjet printers and has scanner and copier functions associated with it. This printer is popularly used by home users who prefer to use their printers for small office work purposes. The Epson Stylus SX400 Ink Cartridges of this printer can be a bit expensive but last for long and its compatible cartridges are much low in cost and give high printing assurance as you get using the original brand. If we talk about general features, the printer is 450‎ x 342 x 182 mm in (Width x Depth x Height), measures 5 kg in weight and is compatible to work with Mac OS 10.3+, Windows 2000, Windows Vista, Windows XP. All In One Epson Stylus SX400 printer is popular with home users who prefer their home printer to have a little more functionality. It is a decent device for those looking for an entry-level printer with additional features that can be used by families or students. Both text and images delivered by this printer give clarity and consistency although the print speed is not necessarily the fastest. What should I do if the layout of my printed document is not proper? How can I reprint or restore my photos from the printer? Start making copies once you are done. Q. Will I receive a set of Epson Stylus SX400 Ink Cartridges in the box when I buy the Epson Stylus SX400 printer? A. Yes, you will receive a set of Epson Stylus SX400 Ink Cartridges in the box of the Epson Stylus SX400 printer. Q. My Epson Stylus SX400 printer is producing very faint printouts. How can I solve this problem? A. If your printer is producing faint printouts or dots are missing, you might be able to solve these problems by cleaning the print head. This will ensure that the nozzles are delivering ink properly. Q. What will be the shipping cost if I order Epson Stylus SX400 Ink Cartridges from this site? Q. What is the maximum printing resolution supported by the Epson Stylus SX400 printer? A. This printer has a maximum printing resolution of 5,760 x 1,440 DPI (dots per inch). Q. What are the differences between original and compatible ink cartridges? Is there any risk in using your compatible Epson Stylus SX400 Ink Cartridges instead of the original ones? A. Our compatible Epson Stylus SX400 Ink Cartridges are much cheaper to purchase compared to the original Brother cartridges. Furthermore, our compatible cartridges are more environment friendly as they are made from recycled cartridges that were used previously resulting in very little usage of new materials or components. There is absolutely no risk in using our compatible cartridges. These are FSC tested products and come with a money-back guarantee, thus ensuring the quality. Q. How do I install the drivers of the Epson Stylus SX400 printer on my computer? A. You can install the drivers by using the CD provided with the printer or you can download from here: https://www.epson.co.uk/products/printers/inkjet-printers/consumer/epson-stylus-sx400#drivers. Q. Is borderless printing supported by the Epson Stylus SX400 printer? A. Yes, borderless printing is supported by this printer. Q. I have run out of cyan ink for my Epson Stylus Sx400. Do you provide cyan Epson Stylus Sx400 ink cartridges individually or will I have to buy all the colours together? A. You have a choice whether to buy the ink cartridges individually or buy them in multipacks which contain all the colours. We provide individual Epson Stylus Sx400 ink cartridges of all colours. Q. 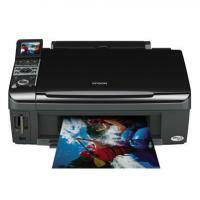 Can I wirelessly print photos or documents via my mobile devices with Epson Stylus Sx400 printers? A. Unfortunately, Epson Stylus Sx400 printers do not come with bluetooth or Wi-Fi connectivity, so wireless printing is not possible with Sx400 printers. Q. I have been using my Epson Stylus Sx400 printer with a Windows PC. Recently I have noticed that there is a misalignment in the words of the documents I have been printing. What do I do to solve this problem? Make sure that there are no warnings/errors displayed on the control panel and that A4 size paper is loaded into the sheet feeder. Right click on the printer icon displayed in the taskbar and select "Print Head Alignment". Follow the instructions prompted on screen to align the print head. Q. How long would I have to wait to print 100 black and white documents with the Epson Stylus Sx400? A. Epson Stylus Sx400 printers have a print speed of approximately 34 pages per minute. So, you will not have to wait longer than 3 minutes for 100 documents to be printed. Q. Should I expect any downgrade in the print quality using compatible Epson Stylus Sx400 ink cartridges? A. Absolutely not! Our compatible Epson Stylus Sx400 ink cartridges are of high quality, that have been FSC tested and certified to work well with your printers. The ink quality in our compatible ink cartridges are as good as the ink quality in original ink cartridges, so you do not have to worry about any downgrade in print quality. Q. What sizes of paper can be used with Epson Stylus Sx400 printers? A. A4 size, letter paper, legal paper, 20x25 cm, 13x18 cm, 10x15 cm, 9x13 cm, 13x20 cm,A5 size, B5 size, A6 size, Envelopes: No.10, DL, C6 can be used to print on with Sx400 printers. Q. Is this printer PictBridge enabled? A. Yes, Epson Stylus Sx400 printers are PictBridge enabled. This means you can print photos directly from your camera without the need to copy the pictures to your computer first. Q. Do Epson Stylus Sx400 printers also come with functionalities other than printing? A. Yes, other than high quality printing, Epson Stylus Sx400 printers are also enabled with scanning and copying functions making it an all-in-one device. This makes it great for small offices as well as for home purposes. Q. How do I check the ink levels of my Epson Stylus Sx400 ink cartridges from my computer? Double click on the printer icon on your taskbar. Open the printer driver and click on the "Maintenance" tab. Under the maintenance tab, select "Status Monitor 3". You will find a graphic displaying the ink cartridge status on your screen. Q. I recently ordered black Epson Stylus Sx400 ink cartridges for my printer. The product was delivered to me on time but it seems to be damaged. What do I do? A. We apologise for the inconvenience caused. Please contact us on 048 308332211 or email us on info@printerinkcartridges.ie within 30 days of receiving your product. Just have your order details and invoice number ready and we will guide you through the process for replacement.